Prime Minister Nguyen Xuan Phuc has decided to provide 200,000 USD as relief aid for the Lao government to help the country in the aftermath of the collapse of the Sepien-Senamnoi hydropower dam. Many Vietnamese agencies and companies have sent in their donations to help the victims in the dam collapse in Laos. He also instructed the National Committee for Incident, Disaster Response and Search and Rescue, to coordinate with the Ministry of Foreign Affairs and relevant agencies to work out measures to assist Laos on the site of the incident and report back to him before July 30. Many Vietnamese agencies and companies have also sent in their donations to help the victims in the incident. On July 25, Vietnamese Ambassador to Laos Nguyen Ba Hung handed over about 2,200 USD contributed by the staff of the Vietnamese Embassy and its agencies in Laos to the Lao Ministry of Labour and Social Welfare to support the victims. Later the same day, representatives of the General Association of Vietnamese People in Laos and the Vietnamese Association in Vientiane also presented 50 million LAK (about 5,950 USD) to victims. Cao Anh Son, General Director of Vietnam’s Star Telecom Company donated 300 million LAK (35,700). The High Command of Military Region 5 of Vietnam asked its South Laos Friendship Co. Ltd. to send 10 medical workers and hundreds of personnel to join rescue and relief efforts. The company disbursed 200 million VND(8,645 USD) to purchase essential goods for local residents affected by the incident, while K53 team under the Military Command of the Central Highlands province of Kon Tum, which was on duty in Laos, was requested to coordinate with Lao forces to search for missing people and help affected residents to overcome the aftermath. 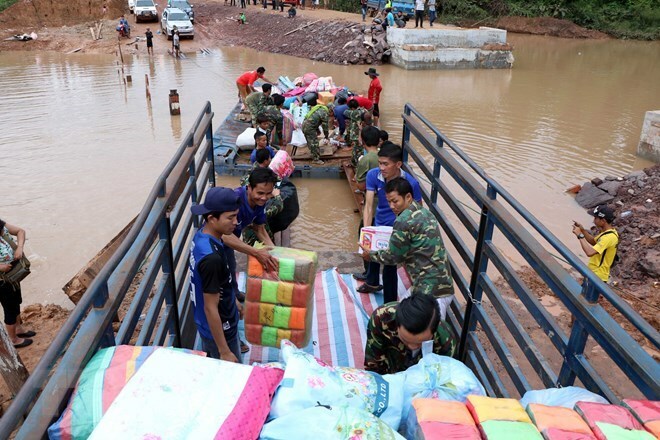 Kon Tum province’s Military Command was also required to prepare personnel, vehicles and materials to coordinate with relevant forces of Laos in surmounting the consequences of the floods when it is ordered by the High Command. The Sepien-Senamnoi hydropower dam collapsed at 20:00 on July 23, releasing 5 billion cu.m of water which completely isolated Sanamxay district. Lao Prime Minister ThonglounSisoulith said at a press conference on July 25 that the dam collapse has already affected 13 villages and is now affecting six others as the flood is still flowing. 131 people are still missing. SK E&C holds a 24 percent stake in PNPC, LHSE 26 percent and RATCH and KOWEPO equally split the remaining share in the project. The project, which is estimated to cost 1.02 billion USD, is the first build-operate-transfer (BOT) project to be undertaken by Korean companies in Laos.